This was just so wild, I had to share this. One of my oldest and best friends, Shelly, had this redo goin` on when I over there awhile back. I was “pretty sure” you all would love to see it too. 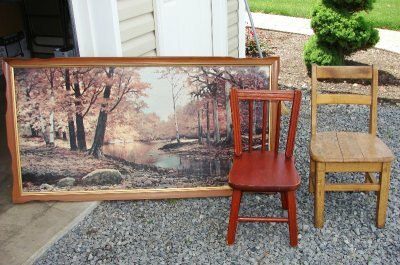 You know those HUGE, 1970s scenery pictures you see at every Goodwill?–I bet even the workers there, know no one is going to buy them. Well, they sold one to Shelly! And I LOVE what she did with it. How cool. 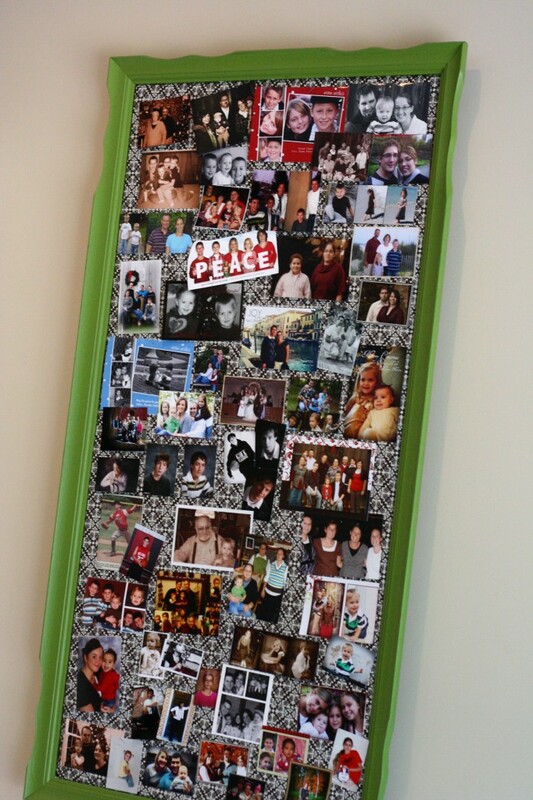 NOW, it`s a beautiful cork board to hold all the family photos she has collected. What a classy way to display pictures. From what I gathered, she just painted the frame, added cork and covered the cork with pretty paper. Love the detail of the frame corner now in fresh green! 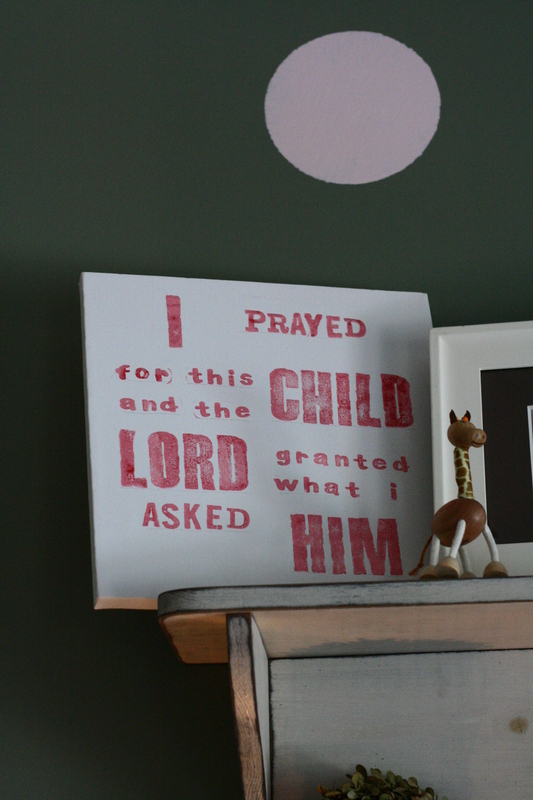 Here is a canvas board she covered and them wrote on with stamps. For more of Shelly`s makeovers, go here. If you are interested in directions on how to make the cork board (above)– Budget Wise Home has a great tutorial here. If you ever have a great before and after you`d love to share– I`d love to show it off for ya. You can email pictures and details to Ilovegk@gmail.com. Oh. My. Word. I LOVE that! I always love those boards with the pictures but they are never big enough. What a great idea. I wish you could come be my advisor for a day. I have issues with my dining room and I wish someone would tell me if I should redo with what I have or put it on the yardsale and go get other stuff. You live too far away. Ay, ay, ay! We have one of those pictures in the basement that has been smoke darkened beyond repair. And I’ve been wanting a big board like that. Now just to ask the family powers that be if I may have that old thing. awesome! how cool is all of this, and how fun of you to feature your good friend! I lovelovelove that! So clever and creative! And because my brain doesn’t think that way, I am especially grateful for Jennys and Shellys and whoever else is featured here for their inspiration. meaning. I AM THE COPY CAT. oh dear. did i fix it? or dig a bigger hole? get some ~ fav word alert~ rest.